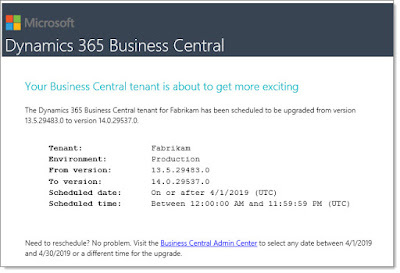 Steve Endow - The Blog: Dynamics 365 Business Central April Upgrade Scheduling - Important Notes! Dynamics 365 Business Central April Upgrade Scheduling - Important Notes! 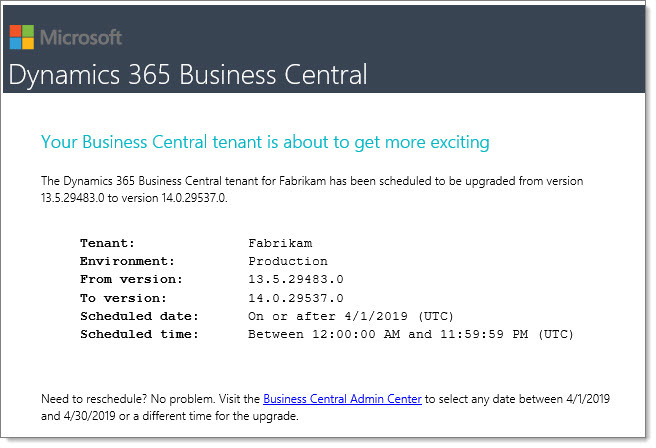 If you haven't read the post on the Business Central for Partners blog about "Scheduling your April 2019 Upgrade for Business Central", I recommend reading it thoroughly. It has several very valuable points about enhancements to the Business Central version upgrade process. Beginning with the April '19 release, we will also send notifications for preview version availability, upgrade scheduling, extension validation, and upgrade failures. Make sure that you have at least one person or a distribution group setup as a notification recipient in the Business Central Admin Center to receive these notifications. For the semiannual major upgrades, you will now have the option to schedule the upgrade for each Business Central environment on a date that works best for you, within a defined date range. The upgrade date range will vary, but will typically be about a month. The April 2019 release will provide you with the ability to have some control over the upgrade date, within a certain date range. The preview version is typically made available for sandbox environments about two weeks prior to the beginning of upgrades rolling out to production environments. The "Upgrade Preview" feature with sandbox environments is very valuable, allowing you to test and review new features. Note that sandboxes will eventually require an additional subscription plan, so be on the lookout for a future announcement about those costs. We’ve created an automated extension validation service that compares dependencies of installed extensions to the schema of the next version. If there are any elements that cause the extension to be incompatible with the next release, you’ll receive a notification letting you know the incompatible extension, and the details of what needs to be changed for the extension to upgrade successfully. Steve Endow is a Microsoft MVP in Los Angeles. He works with Dynamics GP, Dynamics 365 Business Central, SQL Server, .NET, Microsoft Flow, and PowerApps.